This is my last post for MFT, a look back at some of my favorite products just released. Whenever I design for a company, I like to lay out everything I own made by that particular company. With all of the dies and stamps spread over my craft area (read: kitchen table) I couldn't help but pick up the new geek is chic glasses die-namics and then look at the circle die found in the new blueprints 18 die-namics set and think of creating a little face. I adhered the striped cover up die-namic to the card base (in black, naturally... black and white stripes are oh-so-chic) but cut away one of the stripes to make room for the fun sentiment. I don't know if you can tell, but I swiped a light blue marker inside each of the framed areas, between black stripes. I felt like it added a little extra depth to the whole thing. And that's all for me! It's been grand, MFT - thank you so much for having me on as your August guest designer! Adorable use of the Blueprints pieces. Very Creative. 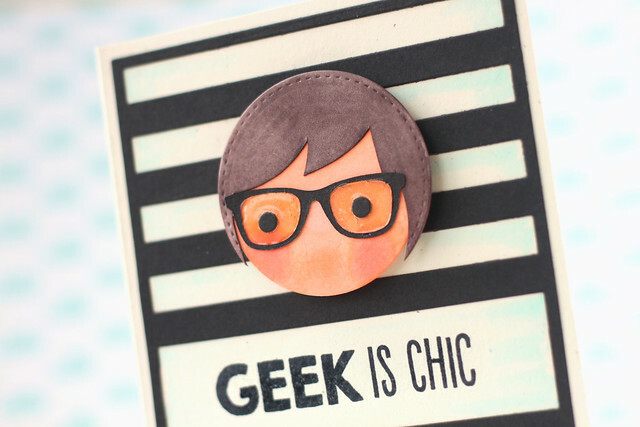 Love all your inspiring projects, especially the "geek" card! Amazing! I have enjoyed all your creativity with this release.....thank you for sharing! 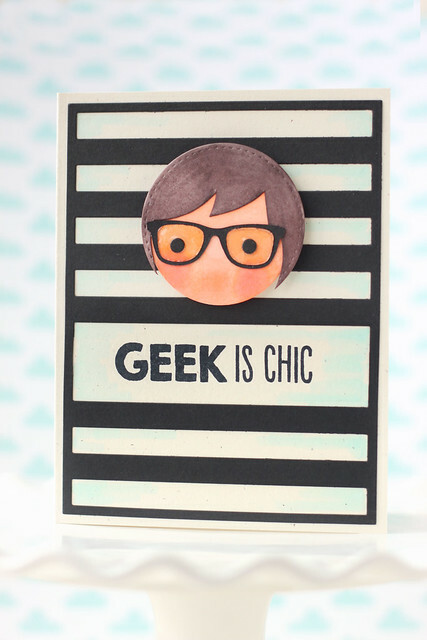 Awesome time seeing your fun creations..love this Geek is Chic card. Awesome creativity to make the face for the glasses! This is definitely a very chic card! I love it! I love it! Totally geeky and kind of urban hip too. How cute is this?! !...Love it!